These lines were penned by Bill Marsh (Jnr.) in 2013 after browsing through 10 years of Southland Branch monthly bulletins. In 1938 the bulletin was known as “The Southland DX-TRA”, but changed to the “The Southland DX Burble” in May 1940. It continued to be published under this latter title until the demise of the NZ DX Club and the establishment of the NZRDXL in August 1948. The club was established before 1933 as evidenced by a few pieces of correspondence that have survived from that year. Unfortunately only complete records dating from May 1938 through to the formation of the NZRDXL survive. This same issue implies that this was the first issue of the “The Southland DX-TRA”, as the following is printed in the opening statement – Well, here we are: This effort will be inflicted on you monthly in the week following the branch meeting. If you like it say so. If you don’t like it we don’t care. The committee appointed to produce the news-sheet at this time was Messrs; A.M. Branks, C.F. Ludlow, L.C. McCormick and M. Rattray. Office bearers in 1938 were; Patron – Mr A.W. JONES, President – Mr R.R. THOMAS, Vice-Presidents – Messrs E. Tansley J. Brighton & A.M. Branks, Secretary & Treasurer – Mr C.F. Ludlow, Correspondence Secretary – Mr L.C. McCormick, Auditor – Mr. R. Ramsay, Committee – ex officio members & Messrs W. Hollamby & W. Gutsel. Regular accounts of the clubs activities appeared in the columns of at least one of the Southland daily newspapers. The newspaper accounts of monthly meetings were very detailed and it was regularly referred to in the news letter as the reference to the minutes of the branch meeting. These columns may possibly have stopped being published or possibly not saved from mid 1939. Perhaps this was a consequence of the onset of WWII and a paper shortage. In May 1938 there is mention of the club being last years winners of the “G. F. Thompson Sheild” for winning the VK3 competition. (At this time VK’s & ZL’s were logged on the broadcast band). The 1938 contest was to be held on Sunday 24th July. In July 1938 Mr L.E. Warburton & R. Ramsay presented cups for the branch competitions. It was decided to award the Warburton cup to the member adding most verifications to his log from 1st August to 31st December, to be judged on the points system. It is assumed this was done annually from then on. The Ramsay cup is to be won outright by the dxer securing the most verifications logged after 1st December and verified by May 31st next. Everything counts except N.Z. both broadcast and short-wave. In 1938 there was regular correspondence between the branch and the Invercargill City Council of the matter of electrical interference emanating from the town’s electric tram network. Interference was so severe that 4YC Dunedin could not be heard clearly in Invercargill. The council was of the opinion that provided listeners could hear the local 4YZ, that was all that mattered. The Club argued on behalf of the general listening public (probably with their own interests in mind) that this eliminated choice for listeners. This situation continued for some time and the club was instrumental in advising the Council what the Auckland Council had done to reduce interference on it’s tram network. In 1939 Merv Brank’s crib at Riverton Rocks was being used for DX weekends. The crib was called “Hillside” at that time. Last Meeting: Held at ‘The Southlander’s” Shack, Riverton, and besides consuming large quantities of Saveloys (hot dogs) and various other liquids and solids, quite a lot of business was transacted. (Merv Branks used the pseudonym, ‘The Southlander’, which most dx reporters of the time were apt to do when reporting to the magazines) Here is a brief resume of the doin’s: 11 present and apologies from Mr and Mrs Dowling, Mr Thomas and Mr Cloughley – Reg, Bob and Roy all went down with ole man flu on the Saturday morning. The short-wave table of points was approved as drawn up by the committee. Copies of this will be issued at the annual meeting (won’t be 1ong now) The short-wave competitions were decided as follows: Best of the month s.w, Commercial stations only. Amateur 3-monthly (on lines of the Aussie 3-month1y) Each member to submit a verif every month for three months and the one with the highest total points wins. This starts with qsls received back in June so start reporting to the Hams now. The other s.w. comp. is most s.w. veries received each six months. The broadcast table of points was left as it is. Letters were received front Jack McLean, Harry Oliff, and Reg Dowling and ye secy received a ring (on the phone of course) from Mrs Bighton who now has the telephone installed so that she can ring up the stations who do not rep1y. Reg. received a letter from the engineer at WJBO complaining that he had received, a lot of dud reports from other parts of N.Z. It was decided to write the station and request them to send the dud reports to us. He also offered a special. This will be arranged later. It was further agreed that the next meeting be held at Charlie Ludlow’s (his wife will be away); to write the Minister of Broadcasting as to when the new radio magazine ‘The Listener” was coming out; to try to buy a small printing press to print envelopes for members; to bring the branch register and log books up to date; that all members at a meeting bring along the verifications received the previous month, country members attending, to bring all veries received since last at a meeting; to send a letter to Mr. A Cox expressing thanks for his efforts to get a meeting of the Advisory Board; a vote of condolence was passed with Mrs Choppin, Timaru, in the loss of her husband; to approach Southland branch of the N. Z. DX R.A. for an inter-branch competition (this was subsequently introduced); if two qsls received for the one report only one can be entered in competitions. Community Listening: IMPORTANT! All are urged to take part in the following competition. Member are to listen to 2LF, Young, on 1340 kcs on Saturday, April 29, from 11 to 11.30 p.m. N.Z. Day-light Saving Time and take as full a report as possib1e during that time noting all details of fading, interference etc. These reports are to be brought or forwarded to next meeting where conditions in the various places can be compared and much interesting information should result. The reports will then be sent on to 2LF. Perhaps we could ask 2LF to send a special letter to the dx’er sending the best report. We are depending on our country members to co-operate so let’s have every jolly member sending in a report. In July 1939 it is announced that Frank Rose is the club Patron. In August the position of Patron changed to Mr A.W. Jones a position he had previously held. Frank was re-elected in July 1940. N.Z. DX-TRA: How does that sound for a name? It is distinct possibility. The Director of National Magazines has, as a result of negotiations conducted by our N.Z. President, Mr A1f. Cox, handed the D.X. Club lock stock and barrel over to the dxers themselves, to have and to hold, love, honour and obey. Sorry we are off the track a bit. As a result, the Auckland branch is taking over the administration part, selling of stationery, certificates etc., and the Southland Branch is going to produce, publish and print a N.Z. Bulletin. We are on the track of an automatic feed rotary duplicator, the price of which is £l5, and this DX-TRA is printed on the actual machine. At the last meeting the editors were appointed to secure a suitable machine and if anybody has anything to say against this machine or its work, let him do so now, or else hereafter and forever hold his (or her) peace. The sub, to the new mag, will be 3/6 a year (only 3d. per copy) and a circular will shortly be issued to all members of the N. Z. D.X. Club asking them to support the new magazine. As a hundred subscribers are necessary to make the magazine pay, we hope Southland dxers will do their bit and respond promptly when the appeal is made. Len Boyer became circulation manager. In this same issue is the mention of the Robson Cup for which there will be no handicap. Branch meetings were generally held the first Saturday of each month and at member’s homes. In the March 1940 issue of the DX-TRA concerns were being raised over the confusion between the Southland Branch DX-TRA and the national NZ DX-TRA. The editor was asking for suggestions for a name change for the Southland branch monthly issue. The April Issue was under the disguise of “THE SOUTHLANDXER”. 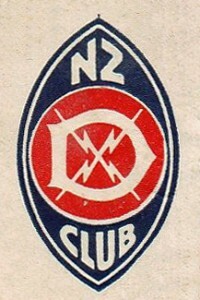 In May this had changed to “THE SOUTHLANDX BURBLE”, a name it retained until the club became part of the NZRDXL in 1948. In the May 1940 issue of the BURBLE mention of the club Patron, Mr Frank Rose presenting a chat on his experiences in radio beginning in 1909. Although there were only 11 present each and every one enjoyed the reminiscences to the full and were the tongues wagging afterwards!! It was the club’s intention to call on Frank to speak again at a future meeting. In the June 1940 issue of the BURBLE it records that Jack McClean who had recently transferred to Wellington is trying to revive the Wellington branch. In the July 1940 issue of the BURBLE Mrs Pinkerton expressed her wish to extend the “Pinkerton Button” contests for a further year. Harry Edgerton presented a cup to become known as the “Diggers” cup. (In October it was decided that this trophy would be won outright by the member of the club logging and verifying the most midnight Yanks during the present season. Midnight was defined as being after 10.30 pm.) There is also mention of a 4ZP cup in the newspaper notice. It is noted that a number of DXers saw service during WWII and this took them out of circulation for varying periods of time. In the February 1941 issue of the BURBLE it is proclaimed that “The N.Z. Dx-tra” is the best dx magazine in the universe bar none and if you don’t get it make inquiries at once – it’s only seven half-pence a month and is crammed full of dxing doings and dope. The March 1941 issue of the BURBLE alludes to the fact that Frank Rose is to be stationed at Hobsonville and that his services as the main fixer of DX receivers will be sadly missed, but conclude that the Airforce have more need of Frank than the branch does. Frank has remained as Patron till this time. This same issue announces that the Otago branch has started to produce a monthly news sheet to be called the “Otago Oscillator”. In the April 1941 issue of the BURBLE it is noted that “life member and former president ”Stan Robson” kindly renewed his offer to present a trophy to be known as “The Robson Cup”. This to be won out-right by the member who logs the most Yanks on their new frequencies. The big frequency change-over took place in the USA on the 30th March 1941. In the June 1941 issue of the BURBLE appears an Obituary – It is with sincere regret that we heard of the passing of Pte. Jack Falconer, 2nd N.Z.E.F. during the recent campaign in the Near East. In the September – October 1941 issue of the BURBLE it is reported that one of our DXing soldiers namely Bob Ramsay is DXing amongst tents and sands in the Egyptian desert. In the November – December 1941 issue of the BURBLE it is announced that a new competition is being introduced Between the Southland Branches of the DX Club & The R.A. – At stake is the “Hunter – Warburton Shield”. The DXer in the winning branch who receives the most of a number of selected stations holds the shield for six months. It is apparent that the nominated stations were changed for each qualifying period. In the January 1942 issue of the BURBLE it is apparent that every member was issued with a numbered membership certificate or card. It is of interest that life member Stan Robson was 1S and Merv Branks was 44S. The letter “S” signifies Southland Branch. You could draw the conclusion from this, that Stan was the founding member of the club in Southland. In the March April 1942 issue of the BURBLE the branch is full on with an inter-branch competition with Palmerston North. Their normal competition with their old rivals the Otago Branch had to be suspended, as too many of it’s members were serving overseas. The May – June 1942 issue of the BURBLE contains many references to the activities of Serviceman overseas including the D.F.M. to Colin Stirling for his gallantry in bombing raids. It also went on to record that Colin’s plane was 1 of 50 that did not return from a 1000 strong bombing raid. A bit of humour from the December 1943 issue of the BURBLE. Merv Branks was down town and confronted a weighing machine – a new type that speaks your weight. Know what the machine said when Merv got on … “No Cheating, One At A Time Please” … I won’t tell you what it registered. It is of note that all through these news-letters there is copious quantities of good old fashioned banter amongst members. Most of you fellows know that the Southland Branch of the New Zealand DX Club produces the 0fficial Bulletin of the Club, “THE NEW ZEALAND DX-tra”. But possibly very few of you realize the great job that has been made of it. 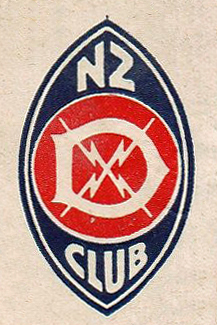 When, on our initiative, the NZDXC was purchased from its previous owners National Magazines, Ltd., publishers of the “Radio Times” and “Radio ‘Record”, the Club was in a very precarious state — on1y the Auckland and Southland branches were active and active dxers outside that did not number two dozen. Subsequent events proved that there were not 100 dxers (not nearly) interested enough in the NZDX Club to work for its survival and its future. Then the War struck the old world and it struck the Club real bad also. Too many of our all too few members answered the call and sallied forth to play their part in the world-wide struggle to preserve the democratic way of life. These chaps are doing their bit to ensure that among other things, the good times we once enjoyed in companionship together in our Club, will come again and come quickly after the ultimate defeat of the forces of evil. And while they were doing that job, those of us on the Home Front had to keep the Club alive in anticipation of that glorious and eventful day when victory is achieved. We hope it won’t be long and then our Boys will be able to return to their loved ones and to us. But to return to “THE DX-TRA” — You can gather that things were mighty tough with the Club in 1940. But Southland had a great team of workers — Charlie Ludlow, Len Boyer, Bob Thomas, Bert Shuttleworth, Max Rattray, Lloyd Warburton, Arthur Cushen, Alex Allan, Charlie Kissell — to help the Editor out. They dug their toes in and produced a Bulletin second to none in the world. Yes, we rnean it. Roy Hallett, b.c. radio columnist in “Radio and Hobbies” wrote: “I honestly think that “THE DX-TRA” is the finest all-round DX magazine on sale anywhere today. Typical of recent American comment: “I must congratulate you as a fellow editor on the swell job that you and your associates are doing on ‘THE DX-TRA”, it can’t be bettered anywhere.” And a former editor and co-founder of ”Tune IN” the magazine of the N.Z. R.A. recently said: “Our mag was once mile’s ahead of yours, but today you are miles ahead of us”. And progress, progress under such adverse conditions is astounding. Branches have been reformed at Dunedin, Christchurch, Nelson, Napier, Palmerston, while subscriptions have poured in from all over the globe. Last American mail, for instance, brought eight further American subscriptions; we have subscribers in every state in Australia, England, Canada, In the N.Z. Fighting Services, in the Australian Forces, in the British Forces, in the American Marines. Today, Mrs Willingham sent a two year’s sub for Ted (of Hastings) who is a Prisoner of War in XVIII Germany. But where is all this leading? Simply this. Your Bulletin is a success but workers are few. Of those listed above, the first six are in Uniform, while Charlie Kissell, although picking up we are glad to say, cannot because of his health give us the help he would like to. This means that the whole work involved in editoring, producing and printing “THE DX-TRA” has fallen mainly on Arthur, Alex and Merv although Dudley Carter is now doing good work as treasurer and circulation manager (he’s in camp for a month’s harvesting, just now). As well as the actual work in publishing the Bulletin there are hundred’s of letters to write and answer. There are still dxers in Invercargill and recently several new members have joined up. Can we appeal to you to give us a hand? It is wonderfully interesting work — but your help is urgently needed. Act now! In the July 1945 issue of the BURBLE there is mention of the trouble gone to secure eats for the up and coming annual meeting because of rationing. In the April 1946 issue of the BURBLE it is announced that the club has arranged a window display of verifications at Radio Centre when the new log chart Columbus are printing is released. It is noted that during 1947 the points system for all categories was reviewed. At the last meeting our president outlined stops that had been taken jointly by the presidents of the Canterbury, Otago and Southland Branches to have a vote taken as to whether Headquarters should be moved to Otago. Members expressed alarm at the attitude taken up by the Auckland Headquarters in refusing to take notice of the protests forwarded by all the southern branches. Concern was also expressed at the general lowering of the standard of “N.Z. DX-TRA”. The frequent remarks made about the former “DX-TRA” Committee are a source of great amusement to dxers all over the Dominion as the many hilarious letters received bear out, but they do not tend to maintain the high standard of ethics adopted by the former committee. The defeatist attitude adopted regarding the explaining away of the present Committee’s inexperience and mistakes makes poor reading. The graph in no. 96 purporting to explain to dxers a method to calibrate their receivers was the method used when dials were marked from 1 to 100 (about l4 years ago was the last time it was used) will make “The DX-TRA” the laughing stock of the DX World. Lloyd, Merv, Arthur, Alex, Bill, Dudley, George and Des were up in Dunedin for the Ranfurly Shield game and this visit happily co-incided with a conference of South Island DXers. While in no way an official club function many famous names made familiar to all dxers by their appearance in “The DXtra” met for the first time. Many were the DX “fish” stories recounted. Probably the best joke was: “Do you know anything as hopeless as looking for a needle in a haystack?” Answer “Yes, trying to edit a dx paper without a knowledge of dx”. No that is not the answer it should be: “Trying to take the Ranfurly Shield from Otago.” Of course, if you only play marbles you won’t understand the joke. In the July 1948 issue of the BURBLE it is reported that the recent vote for the changing of H.Q’s from Auckland to Otago resulted in Auckland retaining H.Q’s by 42 votes to 32. After browsing, scanning and editing the past 10 years of these news-letters I (Bill Marsh) am none the wiser as to the transition from NZ DX Club to the NZRDXL. I am somewhat disappointed that there seems to be lack of mention of this matter during 1948. Perhaps this is contained in the National N.Z. DX-TRA bulletin …. but that is another story. It is very likely because of an included statement that “the Southland newsletter would not go into competition with the national publication” and this became their guiding principal for all times. Alex ALLAN, Arnold BAINBRIDGE, Lindsay BELL, Len BOYER, Warren BLOMFIELD, Merv BRANKS, Jim & Joan BRIGHTON, John CAMERON, Dudley CARTER, Norman CARTER, Andy CHAPMAN, Roy CLOUGHLY, Ted CLUTTERBUCK, Arthur CUSHEN (1938), Jack DOHERTY, Mrs & Reg DOWLING, Roland DUFF, Harry & Mrs EDGERTON, Joe EDGERTON, Pat EGERTON, Jim ELLIS, Jack FALCONER, Des FRAMPTON, Trevor FERGUSON, Tom FINNERTY, Miss Leone GALT, George GOODSIR, Merv GRAY, Bill GUTSELL, Chas. HANSEN, Bill HOLLAMBY, Arthur HUME, Laurie HUNTER, Fred HURST, Bernie JOHNSTONE, A. W. JONES, Charlie KISSELL, Len KITSON, Maurice LANG, L. LILLY, Morley LINDSAY, Miss N. LINSCOTT, Horace LONGSON, Jack LYALL, Des LYNN ? ?, Chas LUDLOW, I. McBAIN, Les McCORMICK, Noel McDERMOTT, Jack McKENZIE, Jack McLEAN, Bob MacGREGOR, Robin McGREGOR, Mrs GRINDLAY, Bill MARSH, Jim MARSHALL, Graham MERCER, Bill MILNE, John MILLER, Jack MOLLOY, Peter NEILSON, Maitland NICOL, Harry OLIFF, Stan O’CONNELL, Al PERKINS, Mrs D. PINKERTON, D. PROCTOR, Bob RAMSAY, Les RAPLEY, Max RATTRAY, Frank RAWLE, Keith ROBINSON, Stan ROBSON (Life member), John RUMBLER, Allan SCHROEDER, Miss A. M. SHAW, Bob SHEPHERD, Bert SHUTTLEWORTH, Des SMITH, Merv SMITH, Lindsay SPRINGFORD, Merv SPROAT, Preston STEAD, Colin STIRLING, Spencer STIRLING, Ted TANSLEY, Bob THOMAS, Bert THOMPSON, John THOMSON, Owen TODD, Evan TOMBS, Abraham (Abe) WACHNER, H.V. WALSH (of Radio Centre), Lloyd WARBURTON (1938), N. WARBURTON, Norm WHITE, John WILSON, Leeson YATES. A Grade: Robson, Branks, Ure, McSwigan, Thompson, Jackson D., Searle, Buttolph, Hunt, Clark. B Grade: Ludlow, Walker, Blackley, Chalmers, Thomas, McCurdy, Irvine, Richards, Maxted, Lock, Jackson B, Robson Mrs., McKay, Williams, Hollamby, McCormick, Hunter, Sloan, Reid, James, Tansley, Jordan, Edgerton, Rowlands, Dawson, Pearce Miss, McDonald Mrs.
Beginers: Ludlow, Hunter, Williams, Irvine, Thomas, Tansley, Richards, Maxted, Lock, James, McKay, Sloan, Reid, Hollamby, Dawson, Jordan, Edgerton.